Inventory We are a resale marketplace, not a box office or venue. Ticket prices may exceed face value. This site is not owned by Pensacola Bay Center . The Pensacola Bay Center is a municipal arena located in Pensacola, Florida. It is owned by Escambia County and operated by SMG Management. 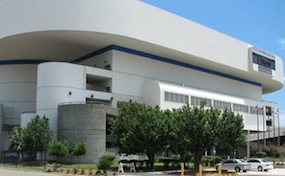 The Bay Center has a capacity of 8,150 for hockey games, and as much as 12,000 for non-hockey events. The arena contains 23,000 square feet of space and 10,000 square feet of meeting space. Perhaps the biggest concert ever at the PCC never took place, Michael Jackson used the venue to rehearse for his Bad World Tour for nearly a month in 1987, but did not perform a public concert at the PCC. PensacolaCenter.com is not affiliated with any primary box office or supplier. We are a privately owned and operated business specializing in sales in the secondary market. To buy tickets for any Pensacola Civic Center in Pensacola simply click on the event of interest or call our operators at anytime.